The Whipray Caye Lodge "Our Belize Vacation" - "Our Belize Vacation"
Whipray Caye is a very small private island located eight miles off the coast of Placencia, Belize, Central America. 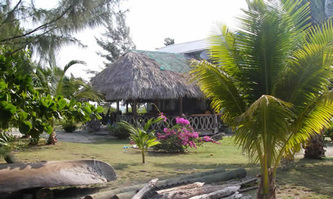 Owned and operated by Julian Cabral and his American wife Beverly, Whipray Caye Lodge is custom made for serious salt-water fishermen and the independent traveler wanting to step away from everyday stress into a pure and natural world - where the fast pace comes to a splashing halt. 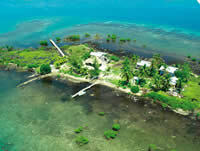 This is a very remote and unspoiled area - one of the few remaining in the Western Hemisphere. With warm smiles and ice cold Belikins at the ready, Julian and Bev make it very easy to unwind and adjust to the slow rhythms of island life. A charming little island getaway, Whipray (Whippari on some charts) Caye is surrounded by some of the finest permit waters found anywhere as well as an abundance of snorkeling-worthy coral and sea life. Two room cabana. Two double beds in each room, ceiling fans and cross-through ventilation from windows on every outside wall, clear and natural rainwater fit for drinking or a nice warm shower on those rare chilly days. Private entry and bathroom for each bedroom. Four full-size beds, total. Two room cabana. Two double beds in each room, ceiling fans and cross through ventialltion from windows on every outside wall, clear and natural rainwater fit for drinking or a nice warm shower on those rare chilly days. Private entry and bathroom for each bedroom. Four full-size beds, total. 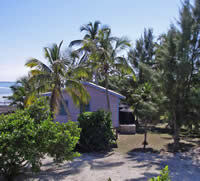 Cabanas supplied by 12 volt generator, which supplies current to every room - that's the fun of island life. Clear clean waters sprarkle with sunlight right outside your door, as you lie in a bed watching the incredible Belizean sunrise. 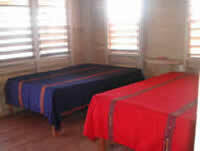 Total of 8 full-size beds between the two cabins. Cabanas are very basic and CLEAN. At the end of the day relax before dinner, in a comfortable hammock on your veranda, and enjoy the view of the glorious Caribbean Sea, contemplating your day with a nice cold Belikin Beer at hand.